Keeping digits warm and functional while allowing access for making a shot in seconds, Manzella's's Thinsulate insulated Bowhunter Convertible is critical for cold weather stalks. Keeping digits warm and functional while allowing access for making a shot in seconds, Manzella&apos;s&apos;s Thinsulate insulated Bowhunter Convertible is critical for cold weather stalks. For years, many outdoor enthusiasts have selected Thinsulate Insulation because of its performance characteristics. Extremely thin and very lightweight, Thinsulate insulation maintains most of its insulating characteristics when wet. The insulation is made up of thousands of tiny microfibers that trap miniscule pockets of insulating air space, providing cold weather protection. Break-Up&apos;s innovative layering of perfectly shaped branches, leaves, and limbs over a distinctive series of bold, dark shadows delivers an incredibly effective all-distance, all-terrain pattern for woodland and bottomland hunting. Mossy Oak&apos;s New Break-Up pattern features ghost shadows, enhanced 3-D illusion and realism of digitized elements like bark, branches and leaves. The natural contrast found in the woods came to life in the details of this extraordinary pattern. they work perfect for ice fishing for me. 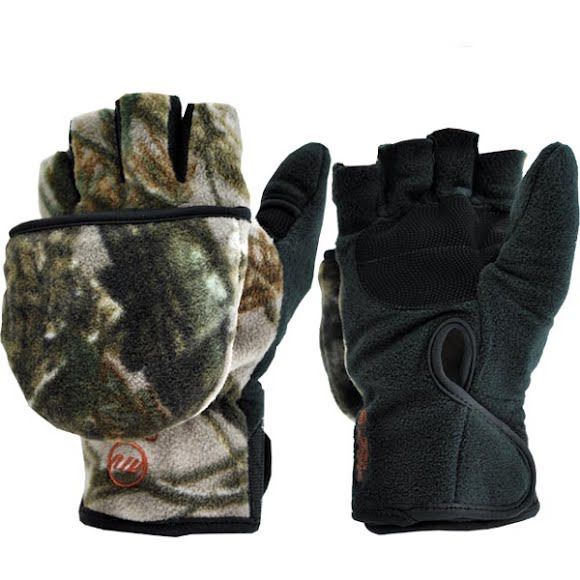 the heat pack pocket makes these gloves toasty and warm after immersing your hands in ice water. with the open fingers and thumb, you can do many things without removing them. this is my third pair and had to order them through the internet and am very pleased with my puchase.